our program on Franconia Ridge. In the fall of 2013, the Adopt-A-Trail Region Leaders identified different work priorities in their regions, including Franconia Ridge. In the spring of 2014, at our annual spring meeting, the Alpine Stewards confirmed that Franconia Ridge was in need of more attention on scree walls because of the incredibly high hiker traffic that beautiful ridge gets each summer. Thanks to their efforts to maintain the trail and monitor it for needed work, the volunteer program was made aware of a pretty important need on Franconia Ridge. Our next step was to set up a scouting trip with Steve Crowe, Franconia North Region Leader, Nat Scrimshaw, Franconia Ridge Trail Adopter, Pete Lane, Coordinating Board Member of the Alpine Stewards, and Brendan Taylor, Volunteer Programs Supervisor, to check out the trail. After scouting the ridge in person and listening to Steve and Nat’s experienced feedback on the work needs of the ridge, and hearing from Pete about his experience watching hikers go every which way but the trail, it was possible to identify needed scree wall and rock step building sites. This information was vital for preparing our two Teen Alpine Spike Crews ahead of their two weeks on the ridge. Those Teen Crews just finished up last week after some rugged hiking, hard work, and beautiful views. Because of their efforts, we have successfully installed over 3,000’ of scree wall, 9 rock check steps, 3 step stones, 1 new cairn, and we maintained 4 cairns and 5 water bars on the ridge to help maintain the tread and guide hikers to stay on the impacted trail and avoid damaging the sensitive alpine ecosystem. Hopefully, now our Trail Adopters will be able to focus on the comparatively easy task of maintaining the trail instead of building scree walls, and the Alpine Stewards will be able to focus on educating users about the alpine zone instead of chasing them all over the ridge in an effort to keep them on trail. 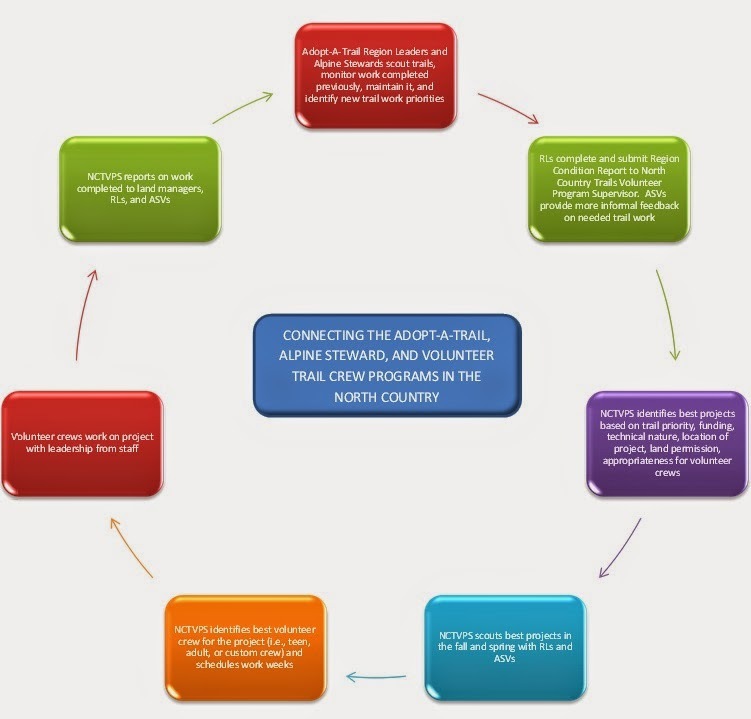 All the while, our Stewards and Adopters can keep the Volunteer Trails Program staff informed of any new needs for work, so that we can send a volunteer crew out if need be and start the cycle all over again of connecting our North Country Trails Volunteer Programs.